HCM CITY (VNS) — Garment producers now have a new strategy to improve both brand recognition and sales – selling through super-markets. Tran Thi Thuy Trang, director of Dan Chau Fashion Co said though her company has 20 stores, its products are present in almost all supermarkets in the south. Thuy Nga, head of business development at Sanding Co said her company's sales of school uniforms through the Co.opMart supermarket chain increased by 10 per cent a year. Most companies agreed that distribution through supermarkets improves brand recognition because they are always crowded. But sellers should introduce new products at least every fortnight, they said, keep track of sales to replenish sold- out items and take back unmarketable ones to keep customers happy, they said. Vo Hoang Anh, marketing director of Sai Gon Co.op – which owns Co.opMart – said in recent years sales of ready-to-wear fashion products have increased sharply, and the number of suppliers of these items increased by 20 per cent a year on average. Consumers prefer to shop for garments at supermarkets because they are of clear origin, priced reasonably and come in diverse designs. 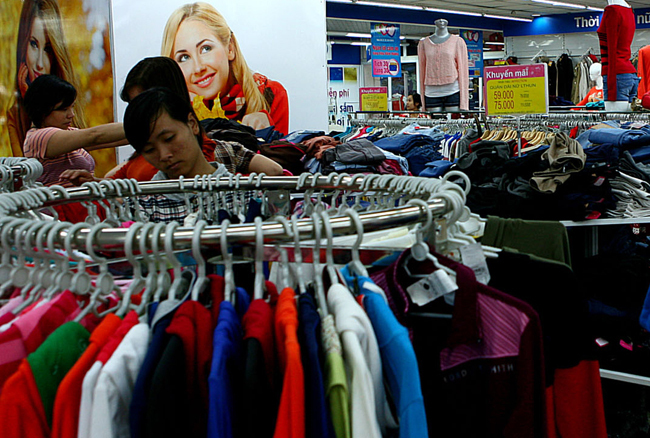 But "garment products at supermarkets currently focus on middle-income buyers," Anh said. Doan Thi Minh Hai, a teacher at a dance school in District 3, said she frequently goes shopping for both work clothes and home wear, and supermarkets offer convenience and choice of design and price. The Co.opMart outlet on Nguyen Dinh Chieu Street in HCM City has a large area for apparel with an eye-catching display. More than 90 per cent of the products are made by private firms and small production facilities.